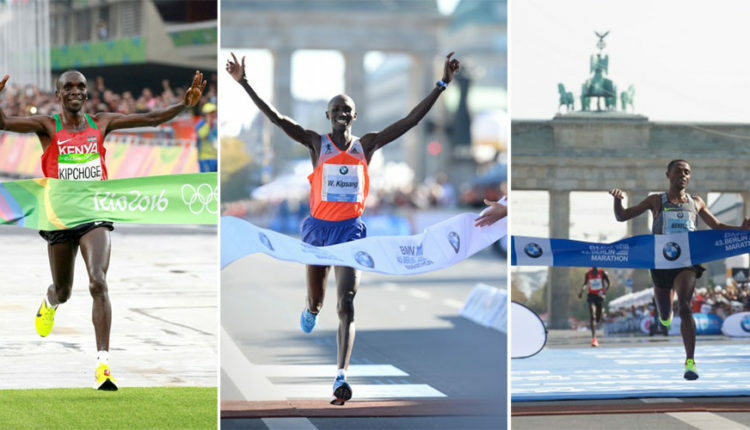 BERLIN — The 2017 BMW Berlin Marathon is shaping to be one of the most exciting editions on Sunday (24). The event is the 44th edition of the IAAF Gold Label road race. How To Watch Live: Watch Free from Germany | CBC Sports will stream the race live online for viewers in Canada and Flotrack and Live on NBC Sports Network will stream the race live online for USA viewers – but needs a subscription. Follow the action on Sunday, September 24, 2017. Elite start at 3:15 a.m. ET. On the men’s side, reigning champion Kenenisa Bekele, former world record-holder Wilson Kipsang and Olympic champion Eliud Kipchoge are all set to battle. All three men are capable of winning the title, given their respective resumes, but it doesn’t seem as though crossing the finishing first is all that they are after. The pundits believe they all want to break Kenya’s Dennis Kimetto world record of 2:02:57, which was set three years ago also in Berlin, so it could very take something special to secure the crown. Sunday’s clash will see Kipsang, Bekele and Kipchoge going head-to-head for only the second time in a marathon but it be the first time they will battle on such a fast course. “There is no question that whoever is running in Berlin wants to have a fast time,” Bekele said. About his target for Sunday, the Ethiopian legend added: “I hope to achieve a personal best of under 2:03:00. Kipchoge confirmed that he will be chasing the world record. “I won’t decide until the last moment how fast I will start out. But I can say this: I want the world record,” he said. Meanwhile, Kipsang, who held the marathon world record for a year, has his eyes well set on winning in Berlin for the first time. “I am only missing Boston and Chicago; I still want to win them,” he said. On the women’s side, Gladys Cherono of Kenya will start as the favourite, having already won the race in 2015 with a blistering time of 2:19:25. “I’ve come to Berlin to attack my personal best,” Cherono confirmed. Four others to pay close attention are Amane Beriso (2:20:48), Gulume Tollesa (2:23:12) and Ruti Aga (2:24:41) from Ethiopia, as well as the Kenya’s Valary Aiyabei (2:21:57), who have all gone under the 2:25:00 barrier. “It’s the norm that leading women runners come to Berlin in order to run fast and have the best chance of setting personal bests,” race director Mark Milde said. Glen Andrews is one of World-Track main writers for long distance and marathon running. Andrews, who competed in cross country during his High School and college years finds passion covering these events. He's also run a few marathons in his time, and still hopes to qualify for Boston.